For some, the difference between right and wrong is as simple as black and white. For others, there are many shades of gray. Some of us live in red states, while others in blue ones. But regardless of where we live and how we see things, I think it's safe to say that there is something that most of us would agree on. Blue and white is always right in decoration. 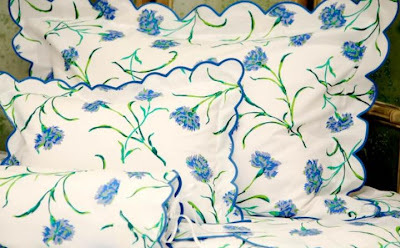 Carolyne Roehm is no johnny come lately to blue and white. 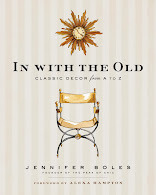 She was using it long before her recent book came out. 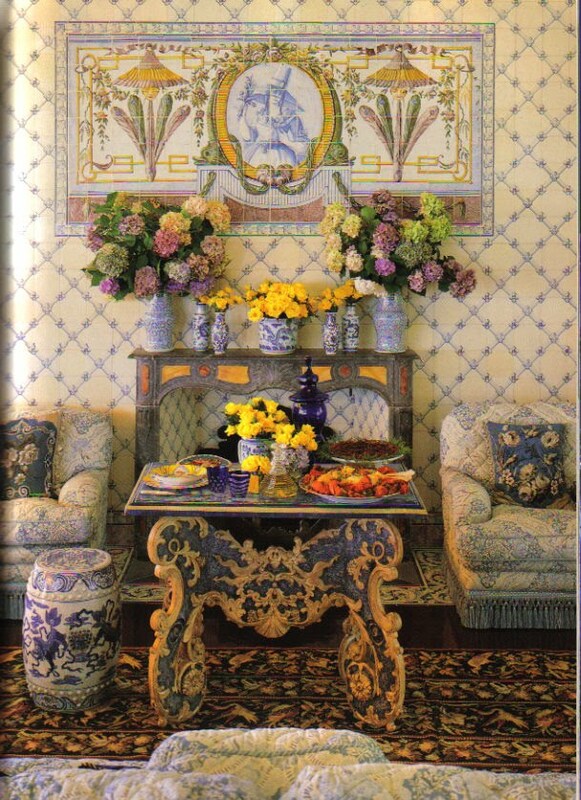 Here, in her Southampton house, there is a wonderful blue and white Portuguese table placed in front of the blue and white tiled fireplace and wall. 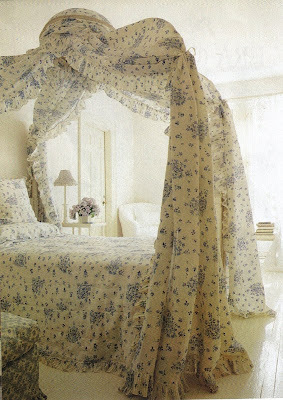 The blue and white quilted fabric with trim completes the breezy look. 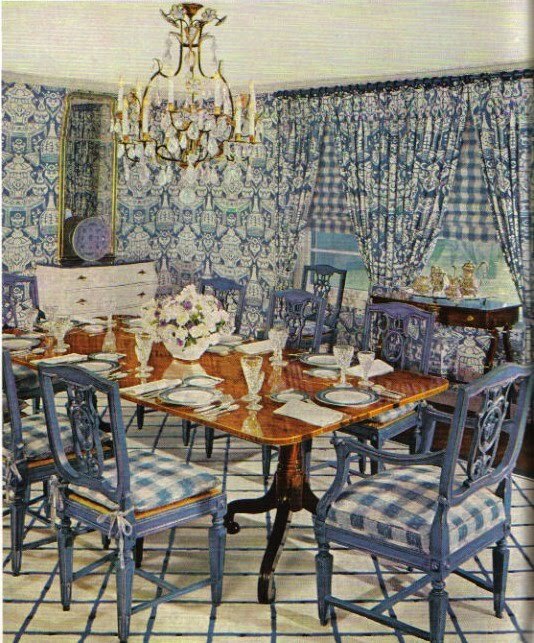 Hmmm, quite an exuberant use of blue and white. You've got the Manuel Canovas porcelain print on the walls and curtains; blue and white plaid on the chairs and window shades; blue dining chairs; blue china; and blue and white lattice rug. Oh, and it appears that the top of the white chest is blue, too. 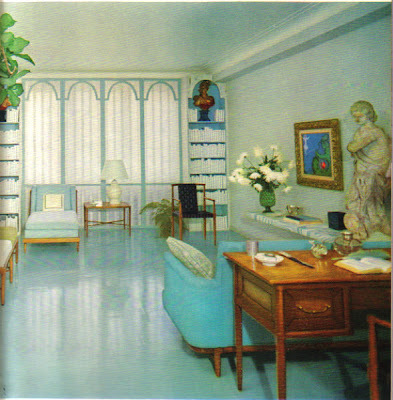 Mallory-Tillis designed this soothing room in the late 1950s. In a weird way, I'm kind of taken with that blue floor. 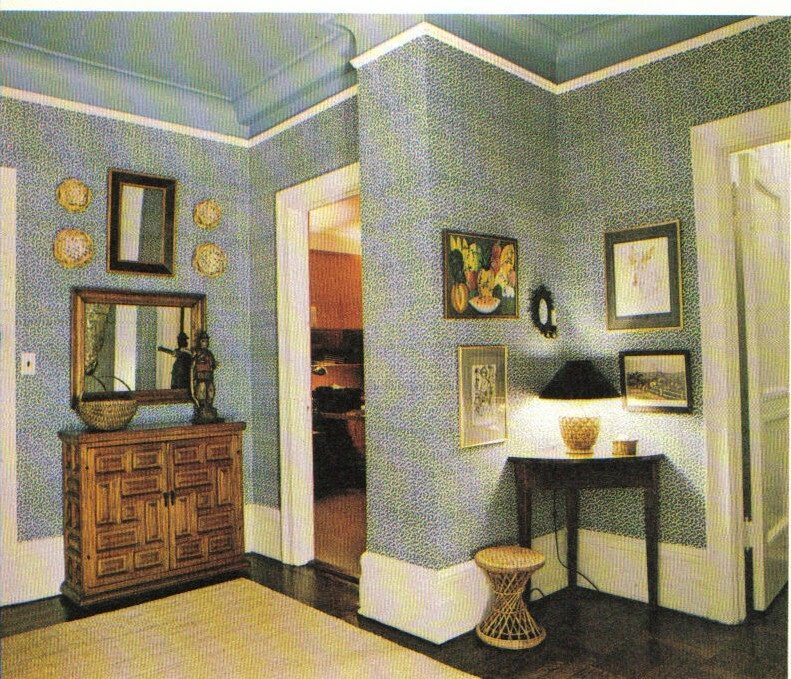 I'm not so crazy about the arched panels over the windows, but I do like the blue-backed bookshelves and white dust-jacketed books. And that marbleized blue shelf is rather wild. I need more china like I need a hole in my head. 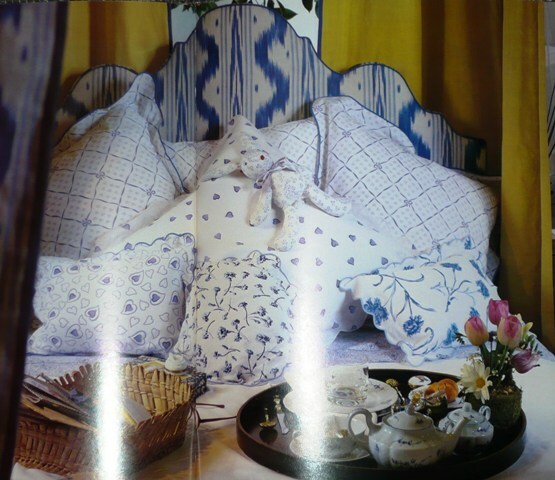 But still, I can always come up with justification for just one more pattern. The one I've been smitten with as of late is Tiffany's "Framboise Rose". 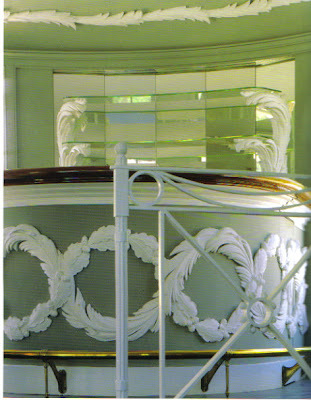 The pattern was part of Tiffany's Private Stock, meaning it was hand-painted in France and...that it was very pricey. Not an issue, though, as I believe the pattern has been discontinued. It's odd, really, that I'm even drawn to this pattern. 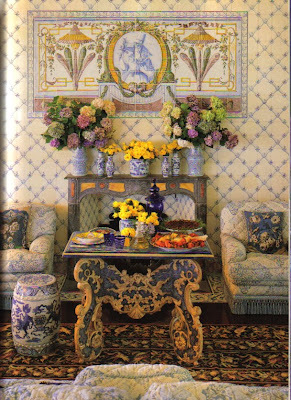 You have to admit that the pattern is pretty feminine, and I tend to prefer more "gender neutral" china. 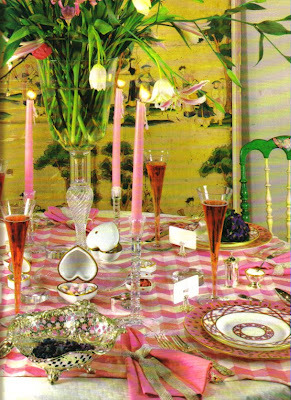 I do like the color pink, though not so much on my table with the exception of flowers and linen. And floral patterned china is not my cup of tea, although the "Framboise Rose" doesn't scream floral- at least to me. I guess the reason is as simple as the fact that the china is really beautiful. That Van Day Truex designed it doesn't hurt either, although I didn't learn this tidbit of info until after I had fallen for the pattern. 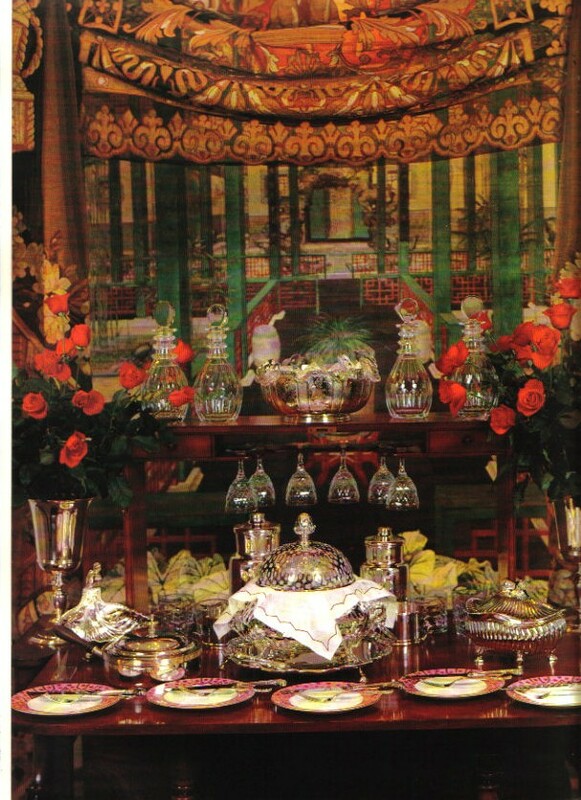 I've culled a few images of the china in situ. 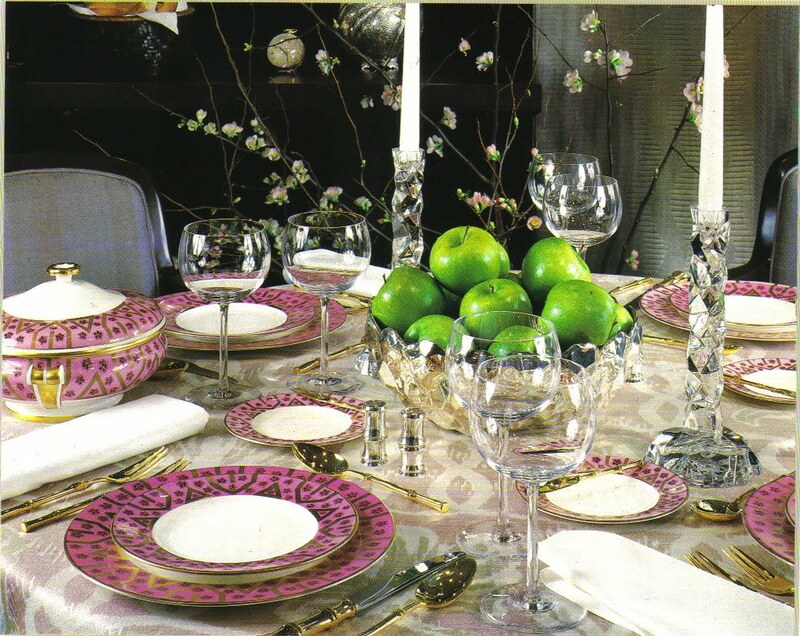 In almost every photo, the china has been placed on pink table linen. Way too sugary for me. I don't mind being in the pink, but this is just too rosy for me. I'd probably mix "Framboise Rose" with plain, masculine flatware and sleek crystal. 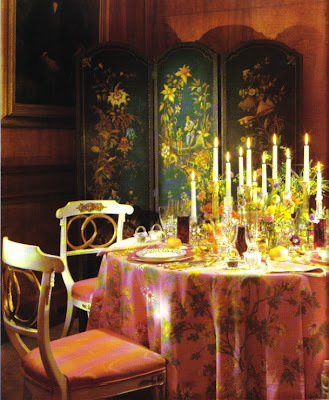 And for the table linen, I'd choose a color or even a print that might give the china an edge. Can't you see it on a solid aubergine or prunelle linen cloth? 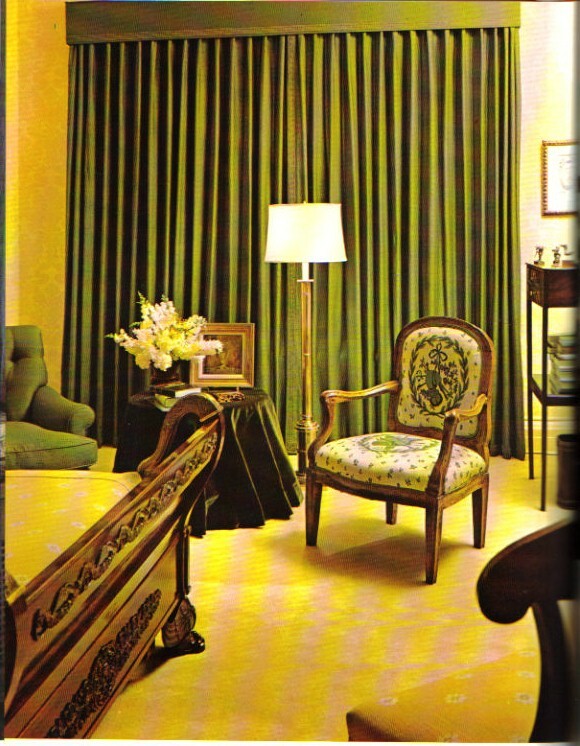 What about mossy green? Even saffron might work. Maybe one of these days I'll get the chance to experiment with my very own "Framboise Rose". "Framboise Rose" in the frescoed dining room of Earl Blackwell. 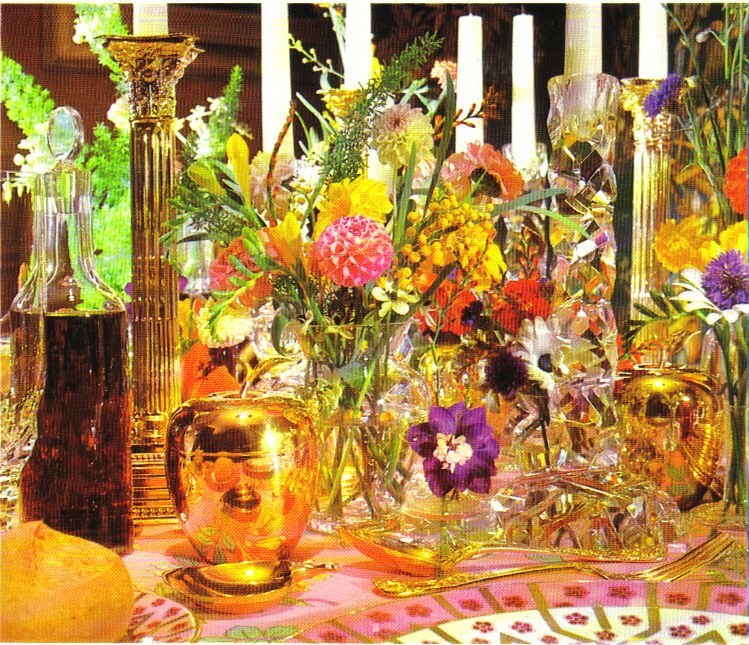 On the table of Mrs. Guilford Dudley, "Framboise Rose" holds court with Rock Cut crystal candlesticks and those fabulous (and famous) Baccarat decanters, both of which were also designed by Truex. Denning and Fourcade must have liked the pattern too. As this is a mouthful, I'm going to quote: "A mahogany cellarette is placed before a trompe l'oeil window composed of a nineteenth-century Chinese panel painting whose summer palace garden is framed by lavish Napoleon III Aubusson tapestry portieres complete with deep valance and gold lace inner blind." Whew! 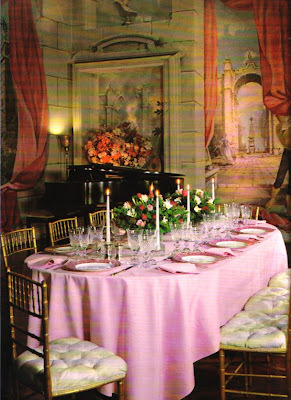 All that pink is excused here since it's a Valentine's Dinner. How extravagant to use those Peretti silver mesh scarf necklaces as napkin rings. 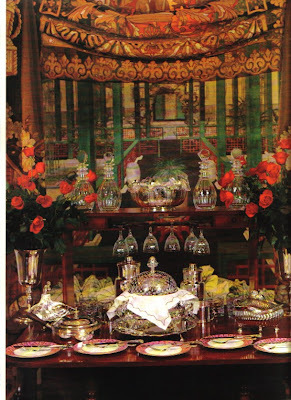 Labels: china, tabletop, Tiffany and Co.
Had I had the sense and style of Deeda Blair, I could have recycled the holey Porthault (or perhaps I should call it the Holy Porthault) and used it in some ingenious way. 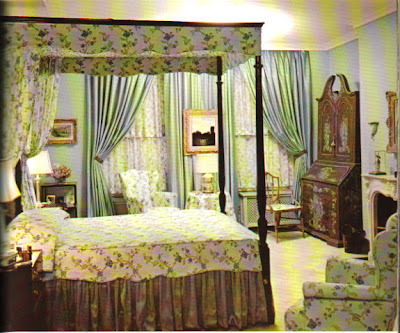 Mrs. Blair took her trousseau sheets and made bed curtains out of them. Truly, how smart is that? Of course, I couldn't say that my Porthault was trousseau, but I could have made something up rather than admitting that it had been saved from the Peachtree Hills Yard Sale. 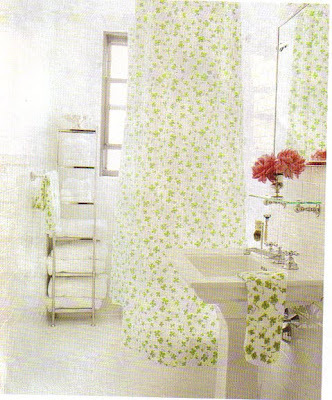 Or perhaps I could have made the cloth into a shower curtain, albeit one that was a little worn and that may not have completely covered my shower. But after seeing this shower curtain née bed sheet in the home of Kate Rheinstein Brodsky, well, I wish that I had thought of this. The napkins could have come in handy too. They would have made great tray cloths. You know, for when I serve myself breakfast in bed on my breakfast tray. 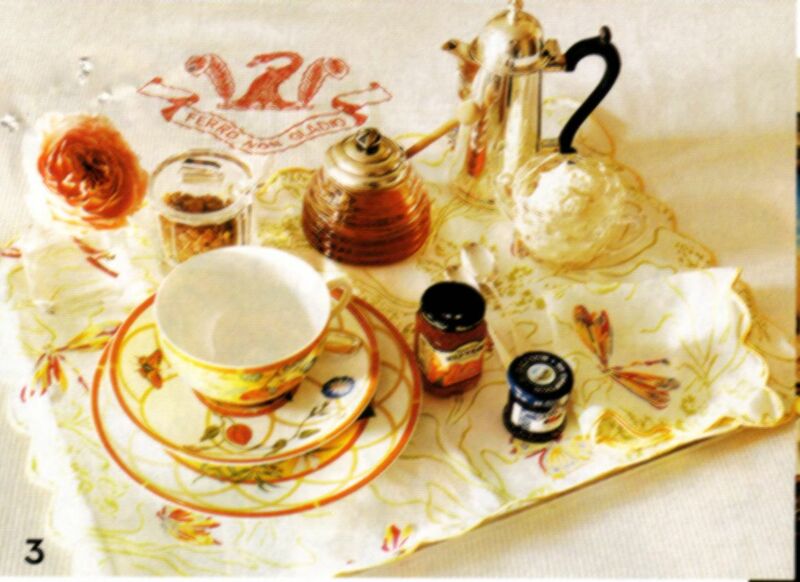 I really do have a breakfast tray, and it's actually Porthault. I wish it got used more often than it does, but going to all of that trouble to set a tray for yourself is a drag. You need someone to do it for you...like CZ Guest. This is probably why her tray, above, looks so enticing. 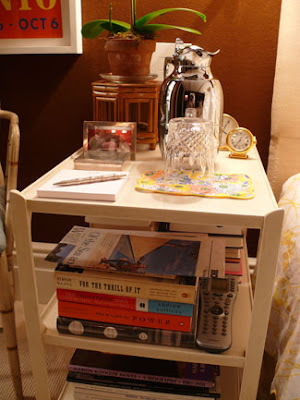 Or, I could have used a napkin to protect my bedside table from my water glass. 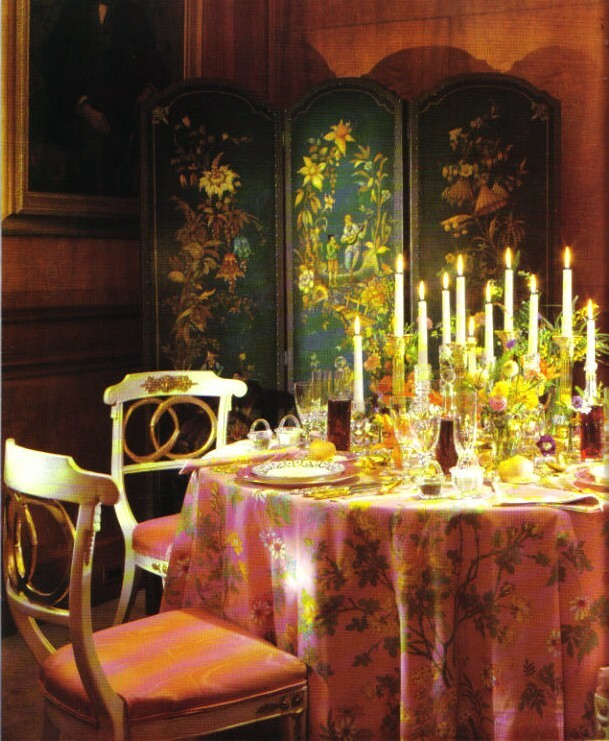 Two of the chicest people I know use Porthault cocktail napkins for such a thing: Chris Spitzmiller and Todd Romano. Oh well, I know that Mom's Porthault is probably in a good home now. In fact, I remember how quickly the female customer scooped it up. I bet she thought my sister and I were a bunch of dummies. And you know what? She was right! It's 8am, I've only gotten five hours of sleep due to a delayed flight last night, and I'm trying to get my motor revving with some extra strength coffee. Needless to say, the thought of cocktails and bars does not necessarily sound very appealing right now. That said, I have had this particular bar- and home- on my mind as of late. 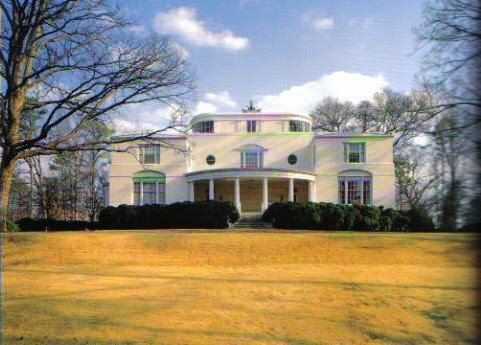 The English Regency house, located in Atlanta and designed in 1936 by Philip Shutze, is rather unusual thanks to that modern, streamlined penthouse, something that would have been in vogue at that time. Actually, I would say that it's still in vogue today. Shutze designed the penthouse in response to the clients' desire for an observation area, obliging them with corner walls filled with windows and roof terraces. But for me it's what's on the inside that excites me...the curving bar that looks as though it's on a ship's helm. 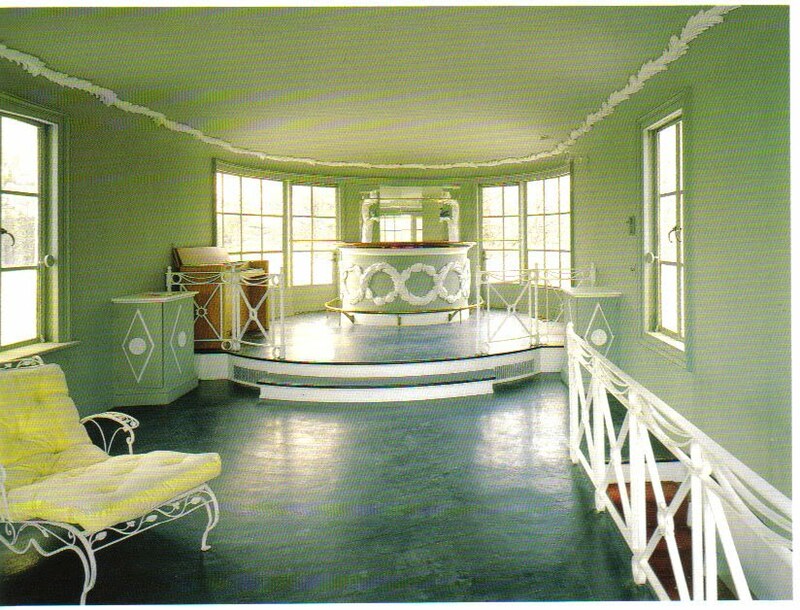 There's a Serge Roche feel to the space what with that plaster detail on the ceiling, those shelf supports, and the ornamentation on the bar itself. And the railing around the bar area and the staircase completes the chic look. The clients were actually a newly married husband and wife who were of the ripe old age of...22 years old! This had to have been pretty heady stuff for such a young couple. But perhaps it was their youth, their enthusiasm, and their desire for something au courant that inspired Shutze to design a home that was a bit edgy for the time. I don't know about you, but I'd give my right arm to have a bar like this in my home. Actually, I'd give my left since I need my right one to mix a proper cocktail. Rx for a Happy Marriage? I've always believed that the key to a successful marriage is separate bathrooms. When one spouse is a neatnik and the other a mess, a battle royale can ensue, and who wants that every morning? As my mother says, sharing a bathroom with a husband who splashes water all over the place is like sharing a bathroom with My Friend Flicka. Separate bedrooms are not so unusual either, although perhaps today it's a little rare. You can just hear the chatter of friends and neighbors: "Did you hear about Betty and Bob? Separate bedrooms. I know, it must be because of that pretty young secretary working down at Bob's law firm." Rumors start swirling, even if everything in the couple's marriage is copacetic. One upside to this arrangement, though, is that you've got two master bedrooms you can decorate. A super feminine one for the wife and something a bit more manly for the hubby. Everybody gets what they want. 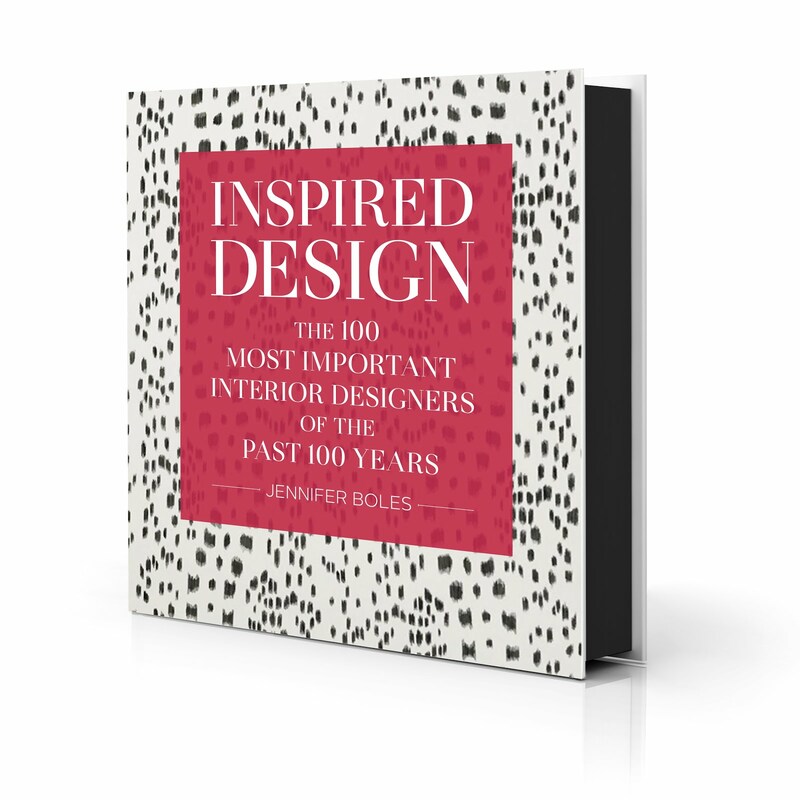 But recently, I was blown away when a designer told me that she has a few married clients who are requesting not separate bathrooms, beds, nor bedrooms, but rather separate condos adjoined by a shared door. 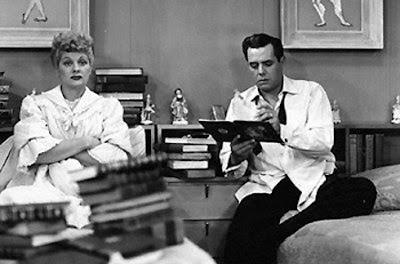 In fact, I've heard of a couple who resided in separate condos on different floors of a high rise. A little unusual I admit, and it's not necessarily something that would appeal to me if I were married. But, who am I to judge? Perhaps it's these brave couples who have the last laugh. Maybe they've figured out the secret to a happy marriage. 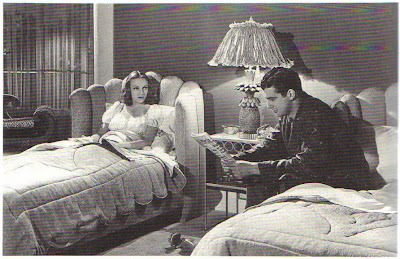 This still from the 1940 movie "I Was an Adventuress" shows beds that look a bit overstuffed. 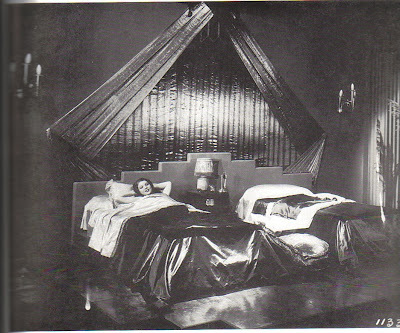 On the one hand, those headboards look comfortable, although I can't tell if they might seem claustrophobic too. Now doesn't this couple look happy despite that chasm between them? 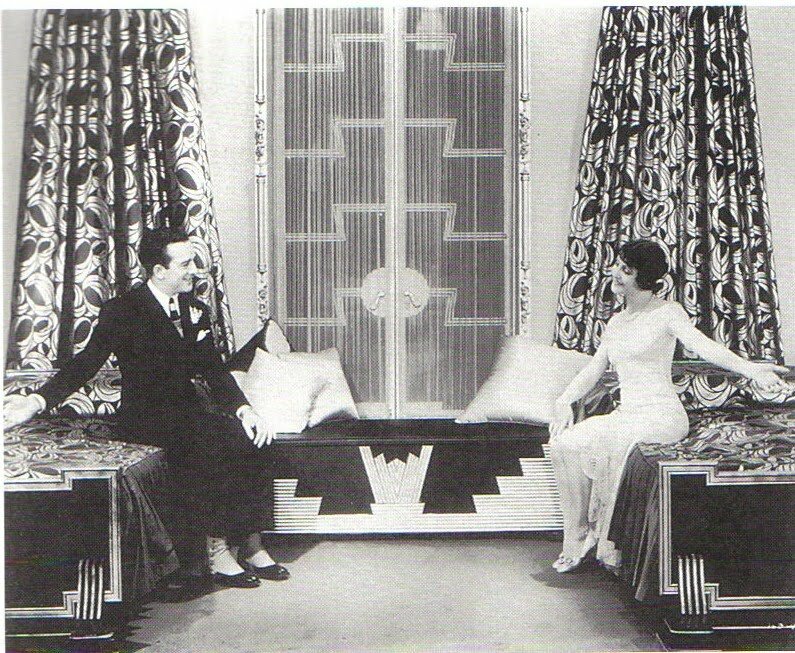 This photo was from the 1929 movie "Twin Beds"; I don't know whether it was a comedy...or a tragedy. I just don't know. After all of this, I'm thinking that sometimes some things are better left behind closed doors.